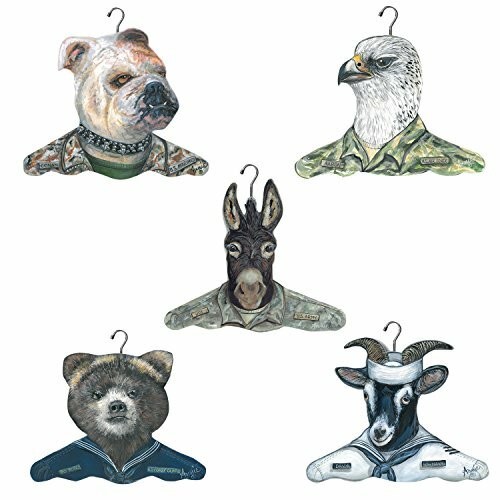 Military clothing hanger 5 pack, air force, navy, Marines, coast guard, Army. Add personality to your closet with this decorative clothes hangers from legendary artist Annie rhinehart and Stupell home. They features an assortment of 5, each proudly displaying animals in the same uniform worn by our service people. With the clothing hanger, you can proudly show your patriotism and support for the military. The art is mounted on wood and hand cut. Made in the USA, this 13in x 17in hanger is ready to use.